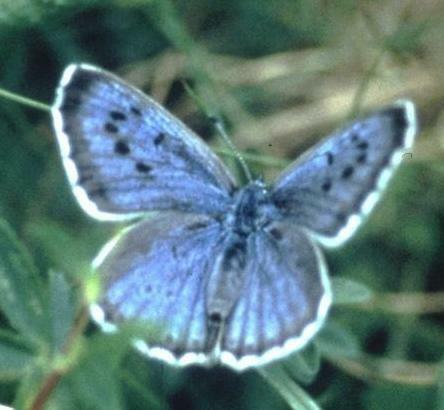 The Maculinea are lycaenid butterflies found in Europe and <?xml:namespace prefix = st1 ns = "urn:schemas-microsoft-com:office:smarttags" />Asia. 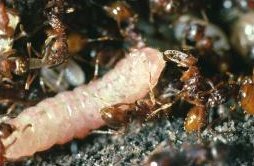 The ecology of all members of the Maculinea genus is unusually complex, involving vital associations between their larvae and particular species of red ants from the genus Myrmica. Eggs are laid on certain food plants on which the Maculinea larvae feed. The fourth larval instar leaves the plant, drops to the ground, and is "adopted" by ants which carry the caterpillar off into their nest, where the Maculinea caterpillar and pupae spends 11 or 23 months as a predator of the ant brood. Each Maculinea species depends on a specific food plant and a specific Myrmica ant host, the ants themselves displaying highly specific habitat requirements. For details see Elmes & Thomas (1992), or Thomas (1995). All five European Maculinea species occur in the Palaearctic region with their centre of distribution in Central to Eastern Europe. All Maculinea are in serious decline and are classified by the International Union for the Conservation of Nature (IUCN) as being either 'endangered' or 'vulnerable' at global and European levels (IUCN, 1990). Each species is named in the European Red List (VanSwaay & Warren, 1999), and three are listed in annexes of the Habitats Directive (Van Helsdingen et al., 1996; Table B 1). The Maculinea exhibit a very low tolerance to environmental change while displaying highly specific ecological requirements (Wynhoff, 2001). 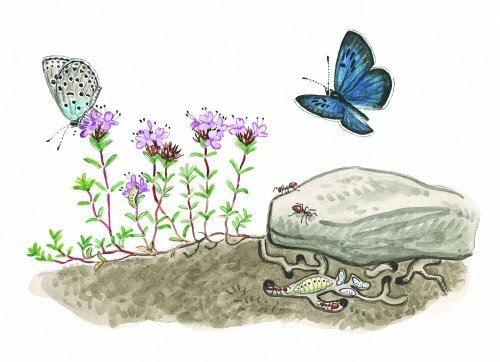 Between them, the five species are key representatives of several of the most valued and endangered types of grassland biotope in Europe, ranging from calcareous to acid soils and from very wet to very dry hydrologies. Theory and some empirical studies suggest that of all the European butterflies, the five species of Maculinea and the specific food plants, Myrmica ants and parasitoids with which they interact could be excellent indicators of biodiversity levels across the wide variety of grassland types that they collectively inhabit, because they possess two additional attributes (Elmes & Thomas 1992): (i) Each species is globally endangered. The rare grasslands that support >1 Maculinea species and their parasitoids may represent the ultimate in biodiversity attainable in that particular ecosystem. In fact, crude inventories suggest that the spectrum of sites from the few that support full Maculinea systems down to the many with just a few common ants is correlated with a similar gradient in high to low biodiversity levels in many other taxa. (ii) This is no chance association. A strong functional link exists between Maculinea butterflies and their inconspicuous host ants which, as dominant keystone species, greatly influence which communities of other organisms can inhabit their sites. Although rare, Maculinea species are highly visible and better recorded than many other rarities, so a good database of their distribution already exists. The five Maculinea species encompass most valued grassland biotopes, ranging from wet to dry, lowland to montane, calcareous to acid. Each potential Maculinea system encompasses a range of grasslands supporting a hierarchy of diversity from sites with Myrmica ants alone (common), to Myrmica + foodplants (frequent), to Maculinea (rare), to Maculinea + parasitoid (very rare), and finally to >1 Maculinea spp. + parasitoids (extremely rare). As specialists at the pinnacle of the food chain among insects, the Maculinea and their parasitoids have more exacting (sensitive) requirements than other butterflies and parasitoids.